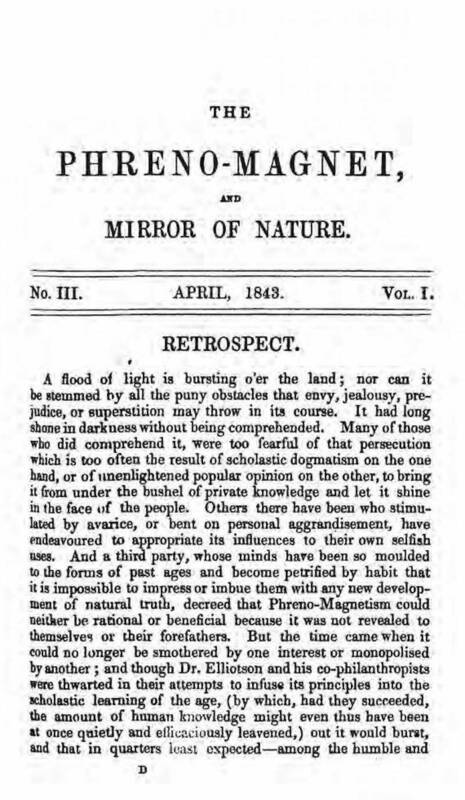 Phreno-Magnet, and Mirror of Nature,The. A Record of Facts, Experiments and Discoveries in Phrenology, Magnetism &c.
London, England. Publisher: Simpkin, Marshall, and Co.. Editor: Spenser Timothy Finsbury Hall. 1/1-11, February 1843. This gave a more popular version of mesmerism than its contemporary The Zoist. Regular contributions by Laroy Sunderland, on whom see the note under The Magnet. Crabtree 483. LOC.